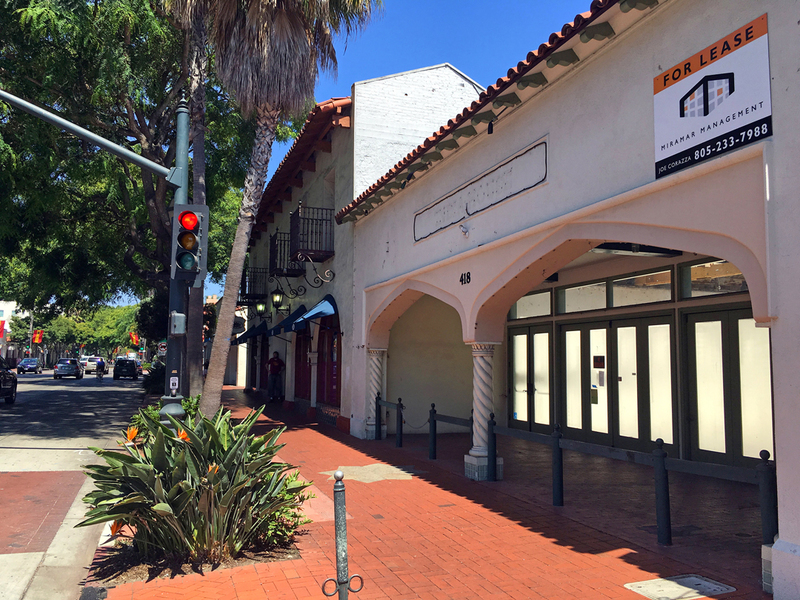 In an attempt to make it easier for businesses to open on State Street, the Santa Barbara City Council voted unanimously Tuesday to speed up the permitting and review process for prospective commercial tenants. Among the changes will be a dedicated city phone line for people with questions about State Street-area commercial tenant space. The city's planning staff will also designate two members to guide downtown business owners and commercial real estate brokers through the discretionary review processes. In addition, applications within the pilot program area will receive priority placement on design review board agendas. Implementing the changes will cost the city about $82,000 in contract staffing for a 6-month pilot period that will cover businesses looking to open on State Street between Cabrillo Boulevard to the south and Sola Street to the north. “Whatever we can do as a city to expedite, to facilitate, to allow the private sector to flourish and do better, is better for all of us,” Councilman Randy Rowse said. The move comes as Santa Barbara is facing a retail crisis on State Street. With more than 30 storefront vacancies, business owners, investors and developers are demanding that City Hall do more to infuse economic life into the downtown core. Online competition from companies such as Amazon and Santa Barbara’s perpetual homeless panhandling problem are among reasons businesses cite for the difficult business climate downtown. The State Street retail problem is one of the issues driving this year’s mayor and City Council race, and business leaders are putting pressure on the candidates to explain their plans for economic development. At Tuesday's council meeting, planning staff said they have been overwhelmed by accessory-dwelling-unit applications — more than 140 — since January, from homeowners wanting to add so-called granny units to their properties. New state law allows homeowners to add new dwelling units to their homes to help relieve the city’s affordable housing crunch. Overall, the city has experienced a 15-percent increase in new permit applications and a 22-percent increase in total plan checks (new submittals and re-submittals) between 2014 and 2017. City staff members also said they have seen a decline in the quality of applications because architects and developers are rushing to have projects completed before the city adopts its own ordinance for accessory dwelling units, which will likely happen next year. The council agreed to a 6-month pilot program for the expedited planning process for downtown commercial applicants. After a status check, the city could extend the pilot program longer. Community Development Director George Buell said turning the pilot project into a year-long program will likely take additional financial investment from the council. Ray Mahboob, an investor who owns multiple large properties in downtown Santa Barbara, said the pilot program should last at least a year. “Six months, I don’t think is enough time,” said Mahboob, who has been one of the driving forces behind approaching City Hall to create a retail plan. City planning staff had proposed that the pilot project area only extend between Sola and Gutierrez streets, but Mahboob convinced the City Council to extend it down to Cabrillo Boulevard to help the commercial tenants inside the La Entrada project. Attorney Doug Fell, who represents the La Entrada project, said there are six retail spaces in the development that remain to be filled. “It would feel better to know we are part of that process down to Cabrillo Boulevard,” Fell said.